Many readers may be surprised to learn that a 110-ton press was selected over a 150-ton press because the lesser-tonnage machine had more flywheel energy operating at half the speed (strokes/min.) of the larger-tonnage machine. This month, press-selection criteria based on flywheel energy is examined in depth. First, some key points to remember from last month’s column: The tonnage rating of a press is the maximum load that can be exerted in continuous operation without causing damage to the machine structure or to its drive system. Available working force decreases in mechanical presses as the above-bottom-dead-center distance of the slide increases because the lever-arm angle—the relationship between the crankshaft angle and the pitman—has reduced mechanical advantage higher up in the stroke. The flywheel stores and delivers the required work energy while the electrical motor restores energy by maintaining flywheel speed and avoiding excessive slowdown. Flywheel energy is expressed in in.-tons of torque. Table 1 lists four mechanical presses, specifying tonnage and energy capacity. Unfortunately, many stamping manufacturers do not include energy capacity in their press specification tables, even though the information is readily available in the press manufacturer’s engineering specifications. The omission of energy capacities often leads to improper press selection, especially for deep drawing applications. The primary differences between the mechanical presses in the table are the drive systems. Nongeared presses do not use any gear trains or gear reductions to transmit torque to the crankshaft. The electric motor has a pulley on the end of its shaft and V-belts connect the pulley to the flywheel. A clutch is positioned between the crankshaft and the flywheel so that the rotation of the crankshaft can start or stop as needed. The number of strokes/min. on non-geared presses are generally quite high in order to maintain flywheel energy.The primary differences between the mechanical presses in the table are the drive systems. Nongeared presses do not use any gear trains or gear reductions to transmit torque to the crankshaft. The electric motor has a pulley on the end of its shaft and V-belts connect the pulley to the flywheel. A clutch is positioned between the crankshaft and the flywheel so that the rotation of the crankshaft can start or stop as needed. The number of strokes/min. on non-geared presses are generally quite high in order to maintain flywheel energy. The primary differences between the mechanical presses in the table are the drive systems. Nongeared presses do not use any gear trains or gear reductions to transmit torque to the crankshaft. The electric motor has a pulley on the end of its shaft and V-belts connect the pulley to the flywheel. A clutch is positioned between the crankshaft and the flywheel so that the rotation of the crankshaft can start or stop as needed. The number of strokes/min. on non-geared presses are generally quite high in order to maintain flywheel energy. Gear trains are used in mechanical presses intended for deep drawing applications. 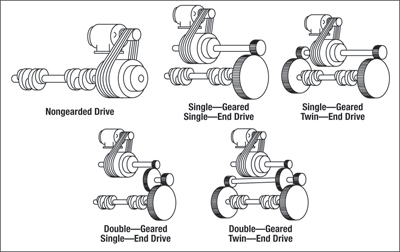 The gear-train may be a single or twin-drive arrangement coupled with single or double-gear reductions (Fig. 1). By adding a single-reduction gear-train, an increase in mechanical advantage is achieved. Additional mechanical advantage is achieved with double-geared presses along with the possibility of longer strokes. With identical number of flywheel revolutions-per-minute, the nongeared mechanical press will have the fastest ram speed (several hundred strokes/ min.) with limited energy capacity. These machines perform quite well for blanking and forming operations and for many progressive-die applications due to the short working distances in the tooling. Single- and double-geared mechanical presses are better choices for deep-drawing applications because slide travel can be slow enough for drawing while flywheel speeds and flywheel energy remain high enough to support the longer working distances. A double-geared arrangement will have the slowest speed (8 to 10 SPM) but the greatest energy capacity.